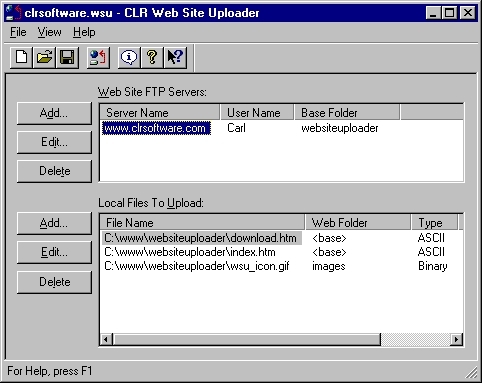 The program CLR Web Site Uploader transfers files to a web site using FTP. Only changed files are uploaded. If the web site folder does not exist, it will be created. You can also upload files to multiple web sites using only one command. Download and evaluate CLR Web Site Uploader today! CLR Web Site Uploader requires Windows 95, 98, ME, NT 4.0, 2000 or XP to run. CLR Web Site Uploader is Shareware. Unregistered users are granted a limited license to evaluate CLR Web Site Uploader for 30 days. Please read the License Agreement and Registration Information in the program's help.